A wooden honour roll with gold lettering. 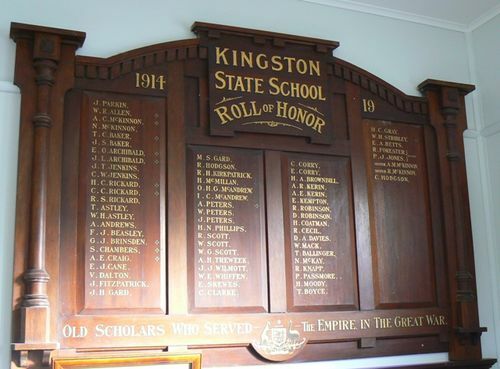 The Director of Education (Mr Tate) is to unveil the honor roll of the Kingston State school on Thursday afternoon next, at 3 o'clock, and the district members and shire councillors will assist in the ceremony. In the evening Mr Tate, who has a great reputation as a public speaker, will give a lecture in the Mechanics' hall, to which all are invited, the admission being free. The shire president (Cr F. H. Carter) will act as chairman. Creswick Advertiser (Vic), 26 November 1918.